The emails only contain the comment ─if they show something at all─ without the original post. We don’t know about you, but we often get “This content is currently unavailable” when we click the links inside the emails. 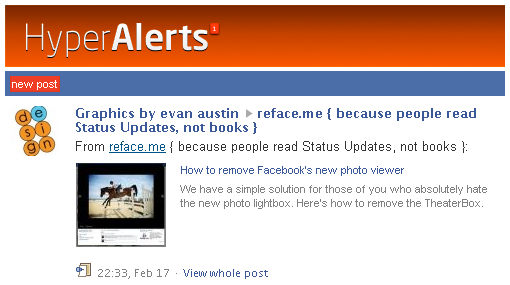 Facebook only sends you alerts for Pages you are administrating. You can monitor updates to any Facebook Page, whether you’re administrator or not. Hyper Alerts sends you hourly, daily, weekly or monthly reports that are visually attractive. A dashboard lets you manage all your alerts. The alerts contain the original posts as well as the comments. Hyper Alerts is a feature for everybody who wants email reports of posts and comments on a selected Facebook-page. You don’t have to be an administrator of a page to get our email alerts, and you can select as many pages as you want. You can get alerts each hour, day, week or month – or immediately if you so prefer. Our emails show the original posts and comments, and are a great way to archive the history of your selected pages – and even make it searchable! » Try Hyper Alerts. It’s absolutely free. Posted by Pieter on February 24, 2011 at 12:11 AM. Use this trackback if you're linking this story.